The Olympian reports today that two more soldiers from Fort Lewis will receive the Silver Star. Click here. A 22-year-old U.S. Army soldier Sgt. Mikeal Wayne Miller from Albany, Oregon died Sunday, more than seven months after he suffered a traumatic brain injury in an attack in Baghdad. Miller is the 116th member of the military from Oregon and southwest Washington to die in the wars in Iraq and Afghanistan since 2003. Miller was transferred to the Fort Lewis Warrior Transition Unit, which aids wounded soldiers. Click here for the Oregon Live story. Congress has told the Army no more Stryker vehicles until General Dynamics fixes problems reported by the 4th Brigade in Iraq. Click here for the Bloomberg story. Care Packages can't get much better than this one. BAQUBA, Iraq - Operation Gratitude, an organization that sends care packages to deployed service members, surprised a Soldier with a 2008 Jeep Liberty at Forward Operating Base Warhorse, Iraq, Jan. 22. Spc. Michael Gallagher from Company A, 2nd Battalion, 23rd Infantry Regiment, 4th Stryker Brigade Combat Team, 2nd Infantry Division from Fort Lewis, Wash. was the recipient of Operation Gratitude’s special care package. 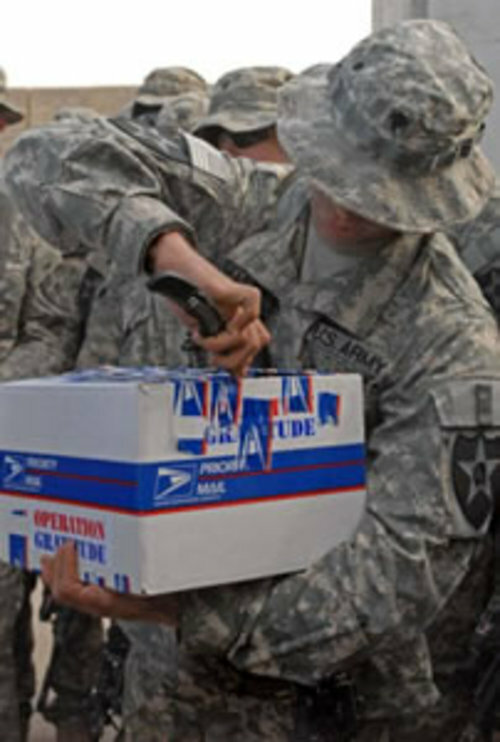 The new car was the 300,000th "package" Operation Gratitude has sent to servicemembers in Iraq and Afghanistan. "When my commander ordered me to show up to this ceremony, I thought it was just another care package and they were making a big deal about it because it was the 300,000th one," said Gallagher. "When I opened up the envelope, (containing the keys to the jeep inside) it completely blew my mind." The care package contained other various gifts from U.S. citizens and companies that generously support the operation, including letters from local schools and four cigars from Calif. Gov. Arnold Schwarzenegger. The Jeep was donated by Chrysler Jeep. In a letter addressed to an "American Hero", Chrysler officials said it was an honor to do something special for both a great organization and for the Soldiers in Iraq. "I would like to thank (Operation Gratitude) so much for supporting the troops and giving them an opportunity to show that people actually care," Gallagher said. The U.S. Army is taking a new approach to helping Fort Lewis soldiers injured in duty who are known as Phoenix Warriors in Fort Lewis by making them part of the Warrior Transition Battalion, which was activated this morning. The military says this new battalion will make it easier for 600 wounded soldiers at Fort Lewis to focus on a new mission: getting better. Click here for the King 5 report. The TNT also had a piece regarding Cpl. Jason Lemke’s death and sacrifice which was honored in the post’s Evergreen Chapel. Lemke is the only Fort Lewis soldier to have died since November, 2007. Command Sgt. 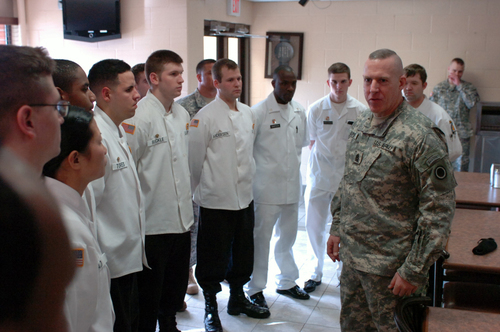 Maj. Frank Grippie, I Corps’ top enlisted Soldier, congratulates members of the 1st Special Forces Group (Airborne) dining facility during a visit Jan. 15, 2008. Grippie presented coins to members of the DFAC’s team that won the “Best in Show” presentation for the 2007 Thanksgiving meal. FORT LEWIS RELEASE - – Family, friends, Soldiers and the Fort Lewis community will remember Cpl. Jason F. Lemke in a memorial ceremony to be held Wed., Jan 23 at 2 p.m. in the Evergreen Chapel. According to the Department of Defense, Lemke, died Jan. 5, 2008 in Ibrahim Al Adham, Iraq, of wounds suffered when his vehicle struck an improvised explosive device. Lemke was assigned to Company A, 2nd Battalion, 23rd Infantry Regiment, 4th Stryker Brigade Combat Team, 2nd Infantry Division. According to unit records, Lemke enlisted Dec. 18, 2004 at Milwaukee, Wis. He reported to Fort Benning, Ga. on Jan. 12, 2005 for initial entry training. He reported to Fort Lewis May 19, 2005, where he was assigned to 2nd Cavalry Regiment (later reflagged 4th Stryker Brigade Combat Team, 2nd Infantry Division). He was assigned to the brigade's 2nd Battalion, 23rd Infantry Regiment on Jan. 8, 2007. The brigade deployed to Iraq in April, 2007. 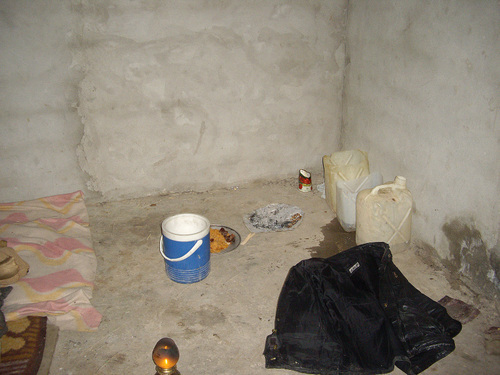 An al-Qaida torture chamber found by Soldiers of Troop C, 2nd Squadron, 1st Cavalry Regiment, 4th Stryker Brigade Combat Team, 2nd Infantry Division from Fort Lewis, Wash., held 14 prisoners at one time, according to the two victims liberated from the cell Jan. 20. Prisoners were bound and beaten with cables and wires and had guns pointed at their head by members of al-Qaida in Iraq. BAQUBAH, Iraq – Coalition forces liberated two Iraqi males with signs of torture from an al-Qaida prison/torture chamber near Arab Jabar, south of Baqubah, Diyala province, Iraq, in the early morning hours of Jan. 20. Soldiers of 2-1 Cavalry, 4th Brigade, 2nd Infantry Division from Fort Lewis, Wash., discovered the building, which was closed off by a heavy, deadbolt-locked door. The Soldiers were clearing the area of AQI in support of Operation Raider Harvest, the Diyala province portion of Phantom Phoenix – a country-wide offensive to rid Iraq of insurgents. Inside were two adult male prisoners. Both were contracted by coalition forces as electricians to install power lines. They had bruises on their backs and legs. Soldiers found braided wire cords, cables and a strap hooked to the ceiling used to hold the prisoners while they were beaten. The liberated prisoners were transported to Forward Operating Base Warhorse for medical treatment, meals and questioning. The two males were kidnapped by al-Qaida gunmen while driving to visit family in Baqubah on Jan. 9. They were bound and blindfolded and taken to the prison chamber. They were routinely beaten and questioned during their first three days of captivity. AQI operatives asked the men for names of Concerned Local Citizens group members in their towns, and also asked them who in the area supports the CLCs and who wants to join CLCs. Rifles were pointed at their heads and knives held to their throats. They were threatened daily and told they would be killed. One male was beaten over the head with a pistol. Both men were bound and struck repeatedly with cables. They were fed rice with dates and one cup of dirty water a day, according to the liberated prisoners. There were 14 prisoners detained in the al-Qaida chamber at one time. The other 12 prisoners were either killed or released, according to the liberated prisoners. The victims were released from FOB Warhorse and reunited with their families the afternoon of Jan. 20. 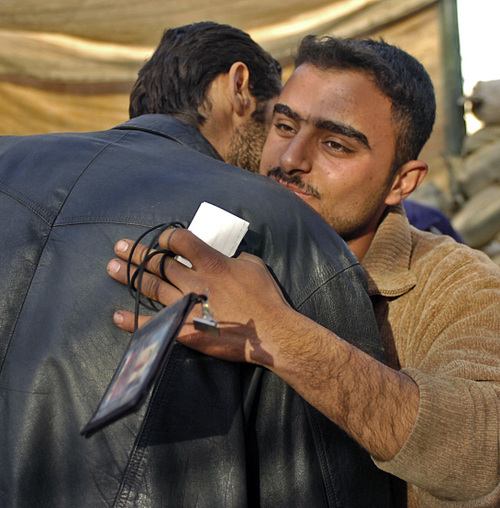 A liberated prisoner from an al-Qaida in Iraq torture chamber is reunited with his family Jan. 20 at Forward Operating Base Warhorse, Iraq, after 11 days of confinement and beatings.